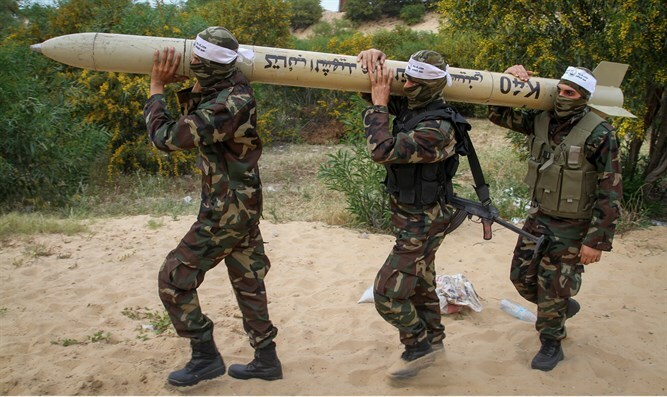 'Hamas is responsible for rocket attack, none of its leaders have immunity,' Finance Min. Kahlon says. Finance Minister Moshe Kahlon (Kulanu), who also serves as a member of Israel's Diplomatic-Security Cabinet, emphasized that "all organizations in Gaza are terrorist organizations." Responding to a Monday morning rocket attack, which damaged a family home in Israel's Sharon region and injured six civilians, Kahlon said, "This is a serious event which the other side needs to pay a heavy price for." Mishmeret, where the rocket fell, is 80 kilometers (50 miles) away from Gaza. "Hamas is responsible for the fire, and none of its leaders have immunity. All organizations in the Strip are terrorist organizations, and we need to treat them that way, including going back to our policy of targeted assassinations. "The incident this morning is a reminder that there are life challenges, there are issues in ongoing security, there's a need to protect all of Israel's citizens, there's the economy and society. This is life itself - the life of every single one of us." Kahlon also emphasized that "Gaza-area communities are equal to the Sharon area." "The response will hurt," he said. "Someone is going to have to pay the price." "The apartment's owner told me, 'The safe room saved my family. We're going to move the family to a hotel.'"